This one day workshop earns 8 contact hours and 6.0 CME through AWHONN. Contact hour credit includes independent study in preparation for the workshop. 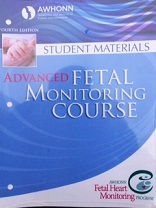 AWHONN has new guidelines for testing and course completion within the Advanced Fetal Monitoring classes. ALL INDIVIDUALS are required to go online within 30 days of class and minimally complete the course evaluation in order to print your continuing education certificate. Tests are no longer administered in the classroom setting. Student Manual must be purchased by the day of class and cannot be shared. AWHONN is accredited as a provider of continuing nursing education by the American Nurses Credentialing Center's Commission on Accreditation. AWHONN also holds a California BRN number: California CNE provider #CEP580. Accredited Status does not imply endorsement by AWHONN or ANCC of any commercial products displayed or discussed in conjunction with an activity. Please Note: Professional attire/scrubs are expected to be worn when attending any Flex Ed course. Students who arrive after the 15 minute grace period will NOT be allowed to attend the course. Continuing Education credits are awarded directly through AWHONN.